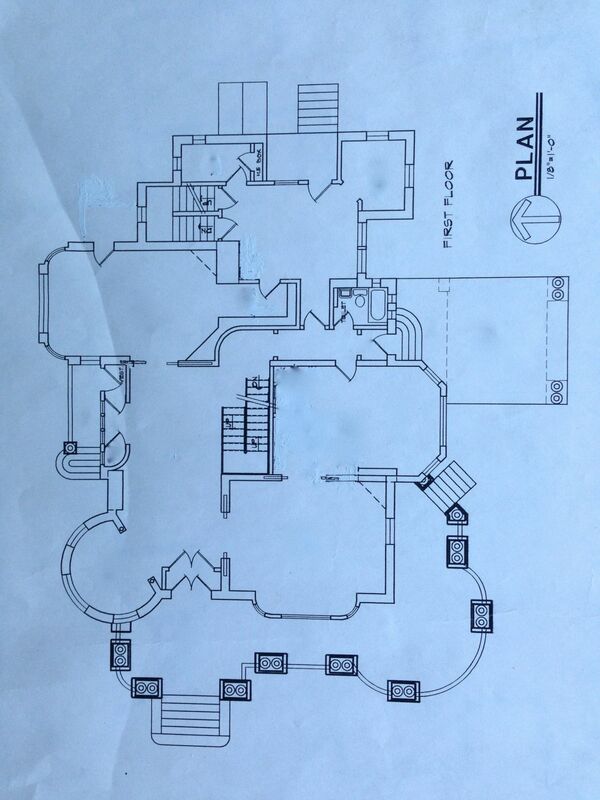 By some miracle, Bob Rodak found the original blueprints to the Cross House. Except for the first floor. Bob graciously included these invaluable documents with the sale of the house to me. I am deeply grateful. The main level (first floor) of the Cross House. 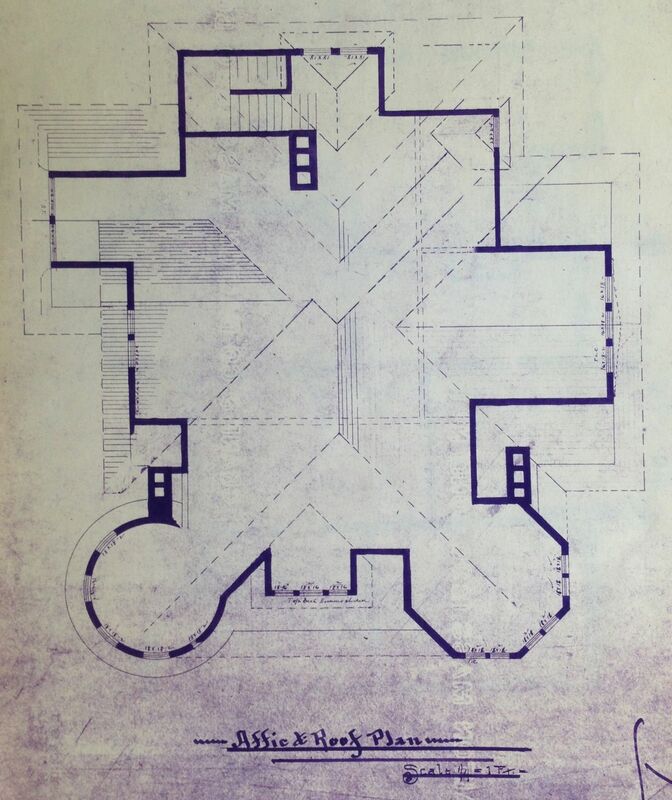 This is a recent drawing as the original 1894 first-floor blueprints have not been found. More information will soon be added. The second floor, from the original 1894 blueprints. I apologize for the blue rectangle; I have no idea why it is there. More information will soon be updated. The third floor, from the original 1894 blueprints. This floor was, as still is, basically one HUGE open space. It is thrilling. It was also never designed as a ballroom, as is so often supposed. If you would like a photographic tour, Old House Dreams (one of my favorite blogs) featured the house before I purchased it. I am not a subscriber yet, but I was trying to do virtual tour, but it wasn’t working for me. Anyways, I’m not a big commenter. I just love old houses mostly Victorians. If I ever win the lottery maybe I can buy one!! It’s wonderful that you have the skills and knowledge to do it properly. The tour is the plans above, and the link to Old House Dreams which shows the interior before I purchased the house. So it is “like” a virtual tour! I was looking through Old House Dreams and came across your blog. I was thrilled to see the original blueprints. 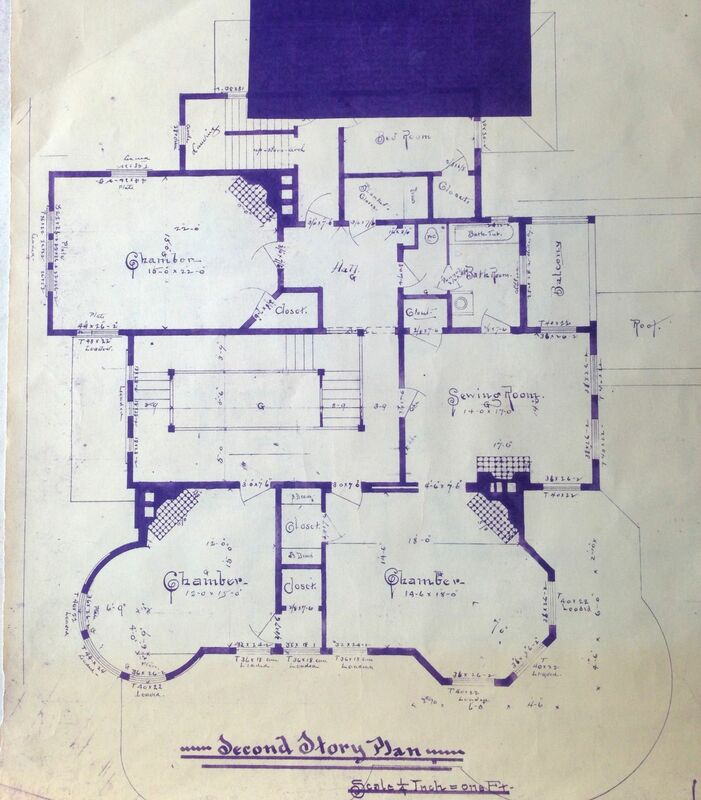 I have been designing and drawing custom homes for more than 35 years so I have a passion for old plans and blueprints. It’s nice to see some of your work. It makes me appreciate your comments I read on Old House Dreams even more, knowing you speak from experience. Thanks for sharing! Glad I finally got the background on all this as I’ve ‘seen’ you on OHD. I ran across your youtube site, “An Old House Love Story” by accident and went to your web site..restoring the Cross house. I am so jealous!! All my life I have done carpentry and fixing up houses. I always wanted a Victorian house but just never got one. I was a divorced mom of one and worked all my life just to support us and pay my little cape cod house off. I learned everything I needed to know by asking people when the need arose. I can make stained glass windows, wallpaper, paint, roof, wall repairs, drywall, pretty much anything I would need for redoing a house except for plumbing. There is a house for sale now in Benton Harbor MI. It’s a great house and just like happens so often, a couple from out of state bought it and told everyone how they were going to restore it ..bla bla bla. Two years later they have it up for sale after they tore down a beautiful carriage house, and GUTTED the second story!!! I can’t seem to get the sellers to respond to me for showing. It’s a great house and I thought you might get a bit of joy at just looking at this house. Some neat backstory on this house is that it was once owned by a female silent movie star. The house is located at 1297 Colfax Ave. Benton Harbor MI. 49022. You could look at it on google or look it up on Trulia. The thieves have stolen most of anything nice like radiators, furnace, doors, etc. They are asking $75,000 but it’s not worth it and they only paid $45,000 before they destroyed it. I’d be very interested to hear what you think of the house. I’d love to fix it up a little at a time and just live in it as is. It’s sitting on a great lot with 1.8 acres., a revene, and a corner, tree filled, lot. I know you are very busy but I thought you might enjoy taking a look at this poor abused Victorian house! Sincerely, Kathy W.
The house in Benton Harbor is pretty fabulous! Thanks! In 2013 it was featured on Old House Dreams. The house, at the time, looked pretty bad and with a lot of damage to the interior. As I understand things, the new owner put on a new roof, and other work. The current listing images show a much more attractive house. I hope a good person gets this fine place! Love all the property, too! I can certainly see why you would fall in love with this amazing structure/home. I’ve restored one 1915 Key West Bungalow in St. Petersburg, Florida on Lane Court, that I fell in love with before entering. Only 1800 sq.ft. though. I’m now restoring/renovating a one-story I bought back in November 2016 to be the French-Country home it was meant to be here in Eureka Springs, Arkansas. I’d love to see updates on your present work and on my next road trip; perhaps I’ll drive up to view your beautiful home. Ross, Your home and it’s recovery is amazing. One question… I noticed several pieces of original Victorian furniture in the home. Were any of them original to the estate? I purchased the house unfurnished. The previous owner had furnished the house with antiques. None were original to the house. I am completely intrigued with this wonderful house. It is a wonderful house! virtual tour area I was blow away that the original plans show a sewing room complete with a balcony and bathroom! That is so cool and definitely inspirational for me – I would love a sewing/craft room with a balcony and bathroom in a future home! Thanks so much for not holding all this to yourself and allowing the rest of us to ‘experience’, in a small way, your beautiful reno. Hi Ross, I just ran across an interview you did for Circa Houses on YouTube and thought I’d check out your site. You indicated that the large square footage worked for you partly because of the storage space you need for your other business venture(s). I wondered if it is or may be part of the plan to install an elevator, if one hadn’t already been installed in the past, for accessibility and ease of moving items through the house without risking damage to all the restoration you are doing? Despite the fact that it wouldn’t be original to the house, I would think something could be created that could be made to look appropriate to the house and/or be discreetly set behind a closet door or something. After all, the new wiring, plumbing, electrical aren’t original to the house, but an argument could be made that they are critical to the building’s continued successful existence and relevance to the community. Your thoughts? There would be no way to install an elevator without altering the shapes of many rooms. There is no vertical raceway (like stacked closets) which could be used for an elevator. I’m sure it’s not a bummer to you, but to me…that’s a bit of a bummer, since I can be OCD about accessibility issues…But that’s my issue, eh? LOL. I’ve been looking over your various pages and pictures and am so excited to see the project progress. Your passion is infectious…I hope it all comes out as you dream it to be at its best and the island idea for the kitchen, IMHO, is a great fix! I am able to access all four levels easily! WOW! Ross how amazing! I just listened to the phone interview you gave on the house that I stumbled on, on youtube. It’s funny that you mentioned how you’ve always felt like you were waiting for something up until you were about a month into the restoration and suddenly realized, this was it! I have always felt I was an old soul because of my affinity for Victorian homes. It is my dream to someday have one myself. I am so happy you were drawn to this home as I constantly see these gorgeous pieces of history neglected and in ruin. So sad to think that history is being ignored and allowed to decay away in so may cases. It would be neat if, when you complete an area, you had one of those 360 cameras document the environment like a virtual tour. Then all those who are unable to visit in person can still revel in your achievements. This is amazing. I love old houses. I do not have the money or experience needed for any of this. Which is why I enjoy seeing people like you that do. I’m so happy that you love your old house. Best wishes.